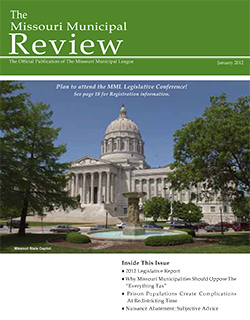 The January, 2012 issue of the Missouri Municipal Review includes my new article on how the Census Bureau’s prison miscount creates problems for Missouri cities at redistricting time. Since the Census Bureau counts incarcerated people as they they were residents of the cities in which they are confined, city officials who are redrawing city council lines must decide whether the people who live next to the prison should be given more influence over city affairs than other residents. The article grew out of our work in the City of Pacific, where the city proposed drawing a city council district where almost half of the population was incarcerated, thereby diluting the votes of residents in all other districts. The article explains that both federal law and Missouri state law permit municipalities to adjust their redistricting data to avoid prison-based gerrymandering, and at least two Missouri cities have successfully done so this redistricting season. 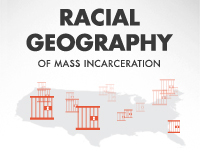 The article includes a section on Missouri state law, but it also includes a good national introduction to the topic, with sections on federal law and a detailed discussion of the factual and legal precedent for avoiding prison-based gerrymandering across the country. In the article, I explain that removing prison populations from redistricting data is a common (and common sense) approach used by more than 100 local governments across the country. 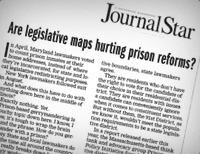 The article ends with a discussion of best practices for avoiding prison-based gerrymandering. The article came out too late for some cities that have completed their redistricting — Fulton has a district that is 47% incarcerated, Chillicothe has a district that is 39% incarcerated, and St. Joseph has a district that is 13% incarcerated — but the article will hopefully help other cities as they update their districts.